We've seen some strange baby gadgets in our time but we'd never come across one that attaches to a vacuum cleaner before... until we discovered the Baby-Vac. 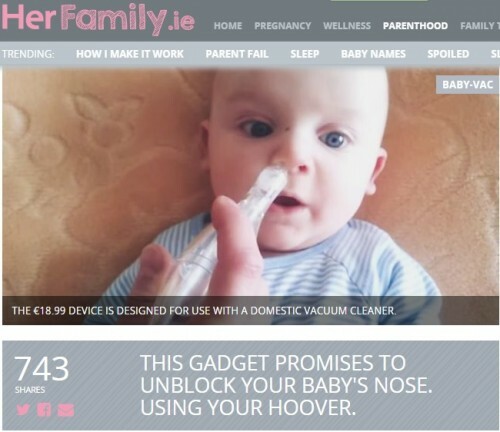 Described as a "nasal aspirator" the €18.99 device is sold for use with a domestic home vacuum cleaner. So how does it work? "The Baby-Vac Nasal Aspirator was designed to provide a consistent and controlled suction using the strength from a common household vacuum cleaner, but not the power." says the pitch. "The Baby-Vac automatically regulates your vacuum's suction power to provide safe, continuous suction." It might be unorthodox but the Baby-Vac does seem to do the trick. Dad of two Stephen Corbally leaves this positive review: "The kids are now 2 and 4 years old and we are still using the Babyvac when they get sick. The main advantage of this product is that it helps to evacuate congestion before it can cause an ear infection." Still curious? In case you are still in any doubt as to how the Baby-Vac operates, this video should answer all your questions. Click here for a list of stockists.